Arctium fruit (Niubangzi)-Arctium lappa L.
Common Name: Arctium fruit, Burdock fruit. Part Used & Method for Pharmaceutical Preparations: The fruit is gathered in autumn and dried in the sun. The raw fruit can be used, or it can be baked and smashed and then used. Properties & Taste: Pungent, bitter and cold. Functions: 1. To disperse wind-heat and benefit the throat; 2. To release toxins and bring rashes to the surface. 1. 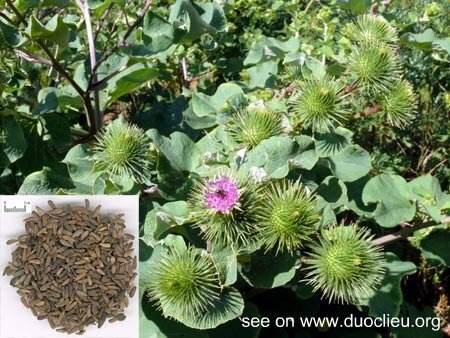 Sore throat caused by invasion of wind and heat: Arctium fruit (Niubangzi) is used with Platycodon root (Jiegeng), Mentha (Bohe) and Schizonepeta (Jingjie) in the formula Niubang Tang. 2. Incomplete expression of measles rash. To encourage rashes to the surface: Arctium fruit (Niubangzi) is used with Cimicifuga rhizome (Shengma), Pueraria root (Gegen) and Mentha (Bohe). 3. Toxic heat manifested as swelling, carbuncles and mumps: Arctium fruit (Niubangzi) is used with Viola (Zihuadiding) and Wild chrysanthemum flower (Yejuhua). Cautions & Contraindications: This herb should be used with caution. It is contraindicated in patients with diarrhea.